Pickled apples are the perfect foil to a smooth and creamy cheese plate or as a topper to a bright spinach salad with walnuts and caramelized pecans. These fresh pickles keep in the refrigerator up to three days. In saucepan over medium heat, stir together water, vinegar and sugar until sugar dissolves. Simmer without stirring for 5 minutes. Remove from heat. Add gingerroot, salt and pickling spice. Quarter apples lengthwise and remove cores. Quarter each piece and arrange in a clean 1 quart (4 cups) lidded glass jar. Pour hot pickling liquid over apples. 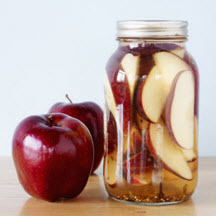 Use a piece of wax paper folded up in the top of the jar to keep the apples submerged in the pickling liquid. Let cool completely at room temperature. Cover and refrigerate for at least one hour and up to 3 days.